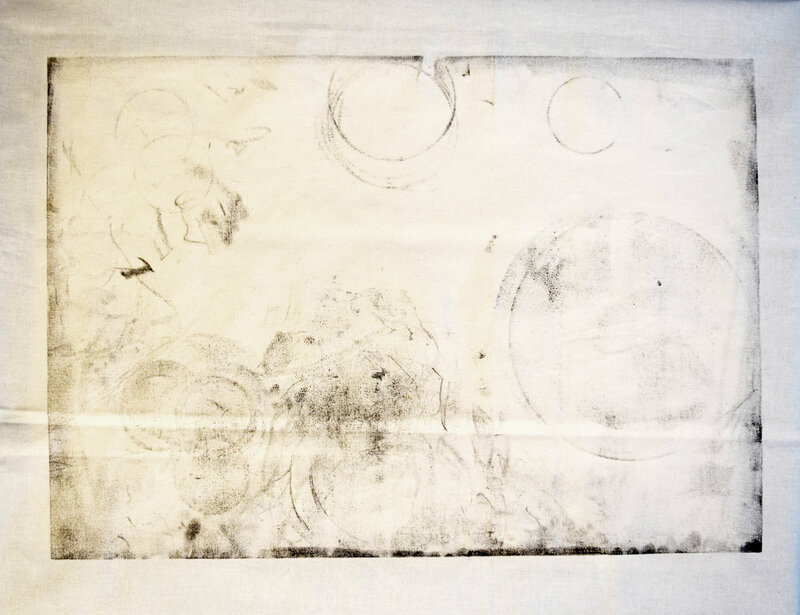 A dining experience that celebrates the gift of time by visually recording traces of movement. A birthday card, a goodbye party, or a holiday present—these are some of the ways that we show appreciation for one another. As a designer, I always intend to make meaningful gifts for the people I am grateful for yet struggle to find the time to materialize my intention. Naturally, this frustration turned into a personal project. I turned to my friends and family to learn from their experiences. I made a survey, individually sent them via messenger, and received 38 thoughtful responses. "To you, what makes a valuable and memorable gift?" The most meaningful, recurring message I gathered from people's personal experiences is the presence of time—time in choosing the gift, time in making the gift, time spent with each other. What do I enjoy most out of time? I realized that I almost always prefer to meet one-on-one with my closer friends. In the time shared between the two of us, we are able to offer our full attention to each other’s emotion, concerns, stories—thus gaining and building a deeper connection. That time is always shared over a meal. 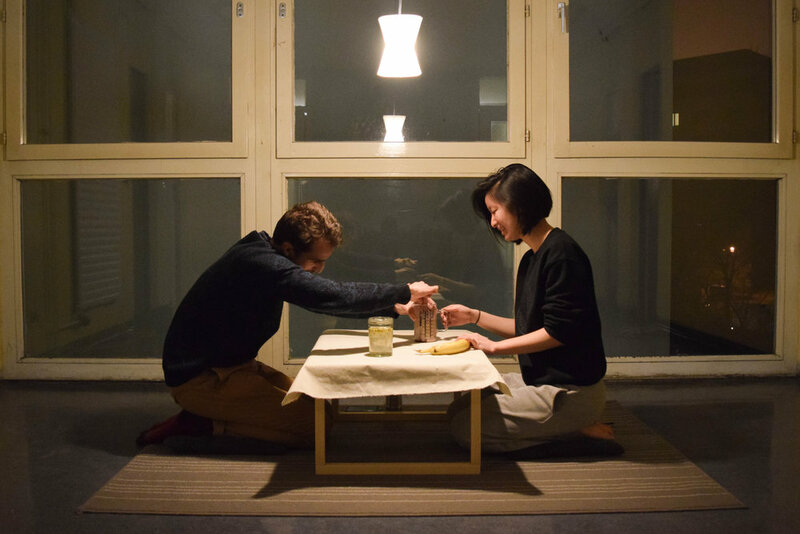 "How can I design a dining experience that visually records the passage of time without disrupting the conversation?" 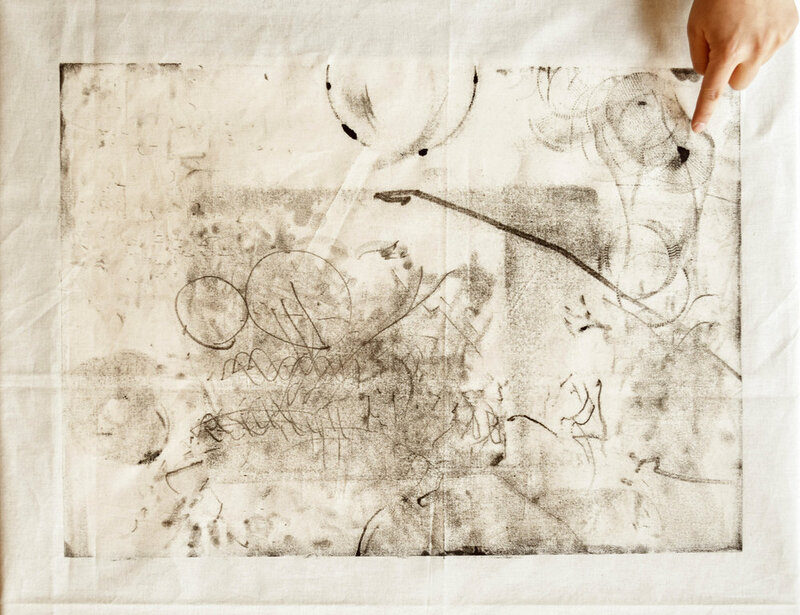 This question was answered when I discovered the beautiful results printed from objects and movement on an inked linoleum sheet. 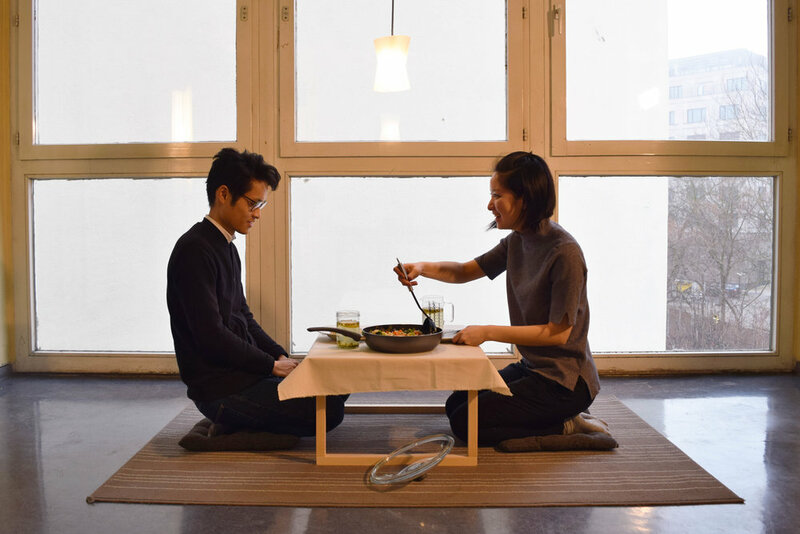 Design a piece of ready-to-assemble (RTA) furniture—for easy travel—that not only incorporates linoleum sheet as the table surface, but also creates an intimate space for two people. With the table, fabric, and ink ready, the last and most important component to the setting is a companion. Here are all the friends who shared their time with me. 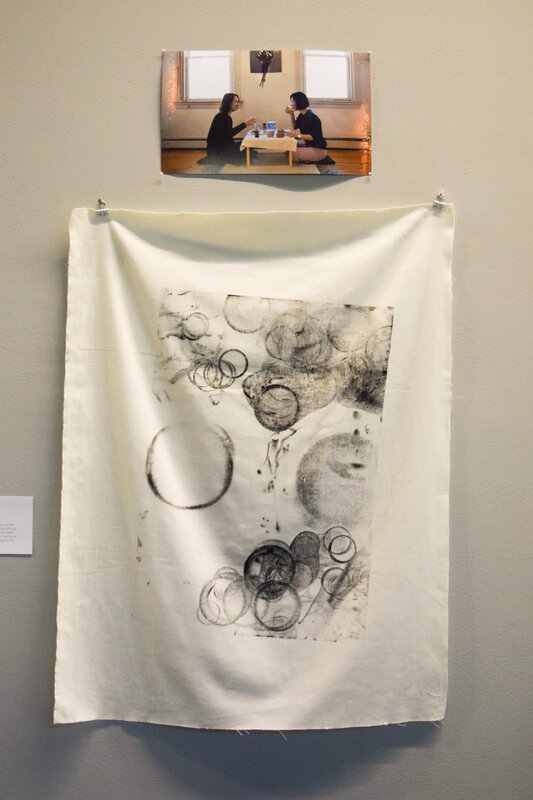 Our Trace of Time was selected as an exhibited artwork and performance piece for the opening of the Touchable Art Exhibit at Perry and Marty Granoff Center at Brown University. 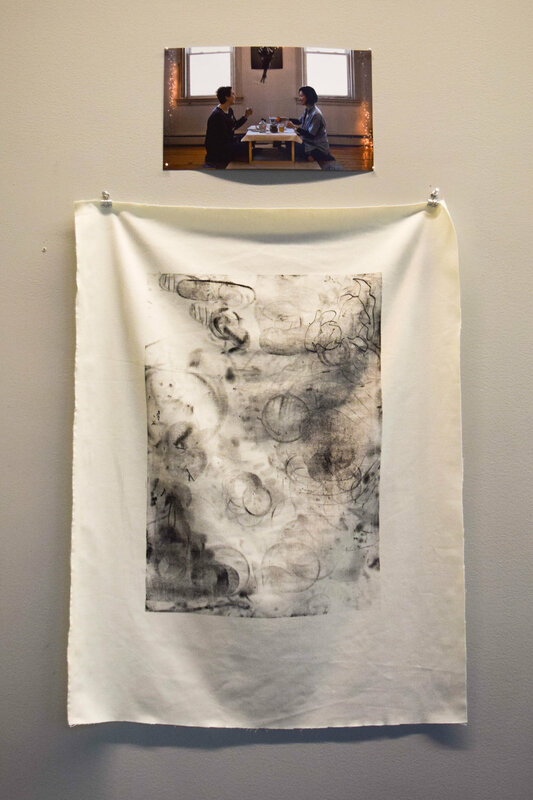 In preparation for the exhibit, I invited friends over to my Providence apartment and made 5 fresh prints to show. 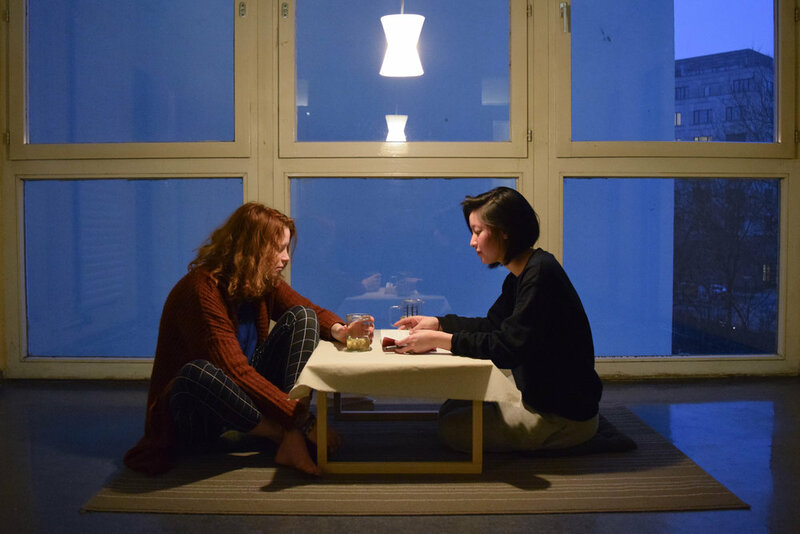 Originally, the table I created is intended to focus on the interaction between two people. But, naturally, time can also be shared between a family of more than two. 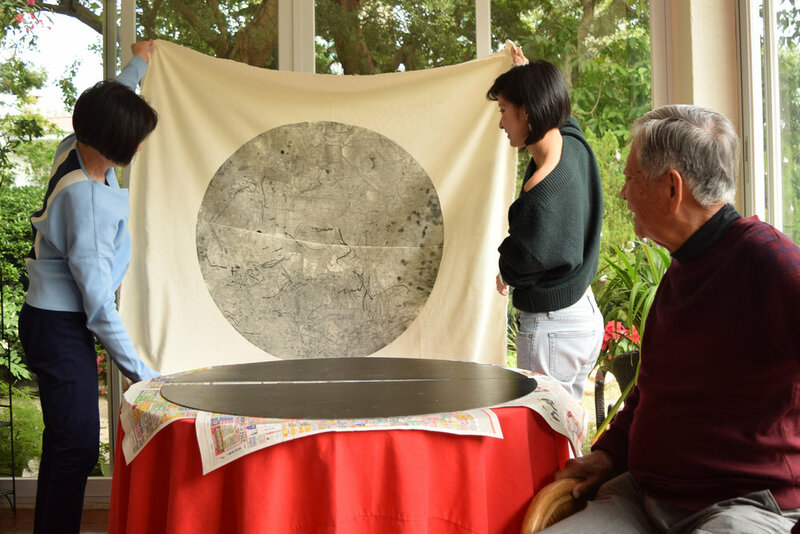 In the following two occasions with my relatives, I customized the shape and size of the ink mat to their existing furnitures. Our Trace of Time will continue evolving in the coming years, just as there's no end to the time shared with people we love.